Triple Coconut Cream Pie & BlogHer Food Recap! 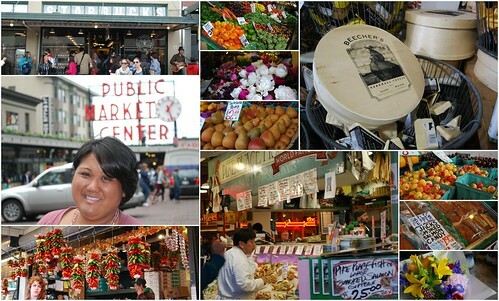 I should mention the wonderful people I had the pleasure of spending time with during my visit to Seattle. My travel buddy and personal friend, Jessica of The Jey of Cooking, had quite an adventure well before we even boarded the plane from Chicago to Seattle. The night before, I got an email and voicemail informing me our flight was cancelled. Um, what?? Yep, no joke. So after confirming it wasn't a prank, both Jessica and I were scrambling on the phones for nearly 2 hours trying to get a new flight, adjusting our coordinating travel plans since we ended up flying separately and yet we managed to maintain our initial schedule. Thankfully, we made it... but yeesh, it was not the stress we needed the night before. But once we met up in Seattle, all was well. We met some pretty inspiring people, saw long time friends we were able to hug for the first time, made new friendships through our love of food, and overall, feel a little closer to the wonderful food blogging community we're all a part of. Aside from all the great folks and food we were surrounded by, the conference had a good agenda where various topics revolving the food blogging world were discussed. Topics ranging from food photography, blog writing styles, social media, various food topics, etc were available for attendees to participate in and absorb the wealth of knowledge and experience shared. The topic discussions I attended were done well, but in general, it didn't fit my perspective or it was a different focus from what I expected. I should have focused more on the photography sessions since those are always so helpful. I was fortunate to attend one photography session that was led by two women who I've known for years... Brady of Branny Boils Over and Bridget of The Way the Cookie Crumbles. They gave a very informative presentation on free and easy photo editing platforms, which was very well executed and extremely informative. Check out their site for links to their presentation! 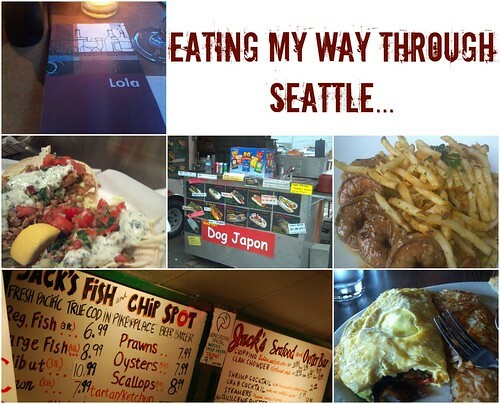 Overall, BlogHer Food 2012 in Seattle, WA was such a great experience. After going, I've been inspired to attend more conferences. Even though it's a year away, I've already registered and booked my hotel for BlogHer Food 2013... in Austin, TX! If you plan on attending or live in that corner of the world, I'd love to meet you and we can geek out on food, cooking, and baking together. Until then, I've been on a food conference roll and I'll also be attending the International Food Bloggers Conference in Portland, OR... as well as the FoodBuzz Festival in San Francisco, both later this year. Will I see you there?! Jessica, Brady and Bridget all agree that this was quite the memorable pie. As a result, we all recreated the pie at home. 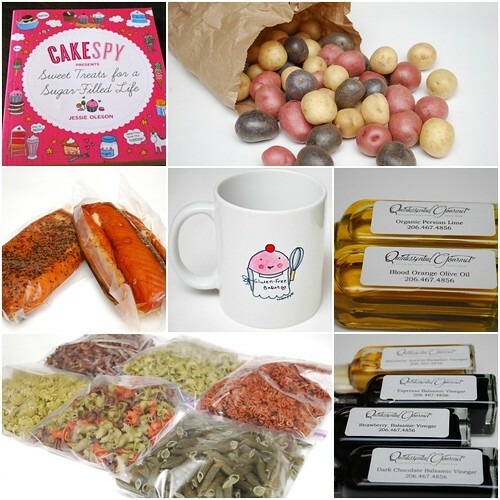 Please check out their pies and their recap on their experience on BlogHer Food - Seattle! Unwrap the dough and roll the dough into a circle about 1/8 inch thick, adding more flour if it begins to stick. Trim to a 12- to 13-inch circle. Ease the rolled dough onto a 9-inch pie pan. Chill the unbaked pie crust at least an hour before baking. Preheat the oven to 400°F. Place a sheet of aluminum foil or parchment paper in the pie crust and fill the cavity with dried beans or pie weights. Bake the crust until the edge is golden, 20 to 25 minutes. Remove the pan from the oven, lift off the foil and beans, and return the crust to the oven. Bake until the bottom of the crust shows golden-brown patches, 10 to 12 minutes more. Remove from the oven and allow to cool. For the pastry cream:In a medium saucepan, combine the milks and sweetened shredded coconut. Add the vanilla to the milk mixture. Place the saucepan over medium-high heat and stir the mixture occasionally until it begins to steam and tiny bubbles start to form around the edges but do not let it come to a boil. Remove the pan from the heat. In a bowl, whisk together the eggs, sugar, and flour until well combined. As you whisk, temper the egg mixture (to keep it from curdling) by pouring about 1/3 cup of the scalded milk into the egg mixture. Then add the warmed egg mixture to the milk and coconut mixture in the saucepan. Place the pan over medium-high heat and whisk until the mixture thickens and begins to bubble. Keep whisking until the pastry cream is very thick, 4 to 5 minutes more. Remove the saucepan from the heat. Add the butter and whisk until it melts. Transfer the pastry cream to a bowl, then place it over another bowl filled with ice water. Stir occasionally until it is cool. Place a piece of plastic wrap directly on the surface of the pastry cream to prevent a crust from forming, and refrigerate until cold, about an hour. The cream will thicken as it cools. When the pastry cream is cold, pour it into the prebaked pie crust, smoothing the surface with a spatula. In an electric mixer with whisk attachment, whip the heavy cream with the sugar and vanilla on medium speed. Gradually increase the speed to high, and whip to peaks that are firm enough to hold their shape. Fill a pastry bag fitted with a star tip with the whipped cream and pipe it over the surface of the pie, or spoon it over. To finish the pie:In a dry nonstick skillet over medium heat, spread the coconut chips and toast on the stovetop. Stir the chips once or twice while they toast until they are lightly browned, 7 to 8 minutes. Remove from pan and allow to cool slightly. 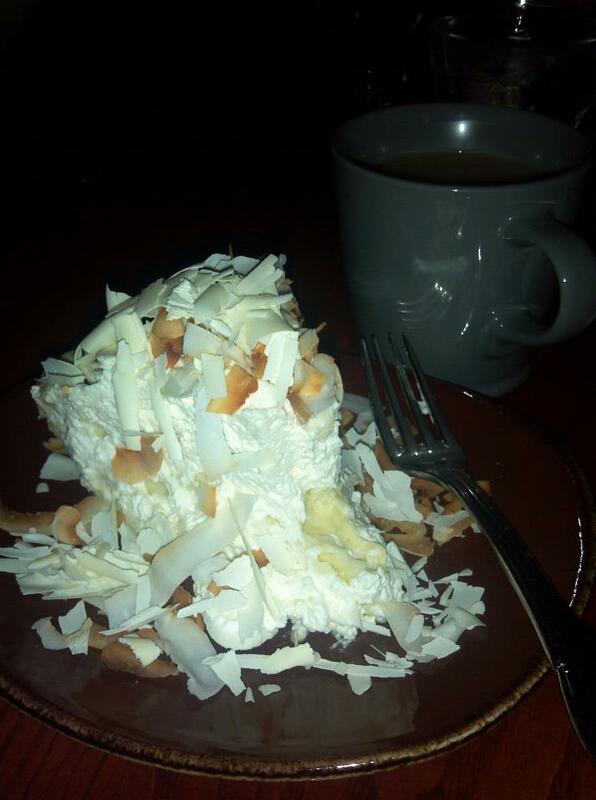 Sprinkle the toasted coconut over the whipped cream layer of the pie. Using a vegetable peeler, shave about 2 ounces of the white chocolate into curls. Garnish the top of the pie with a sprinkling of the white chocolate curls. Make ahead - The coconut pastry cream can be made a day ahead, covered with plastic wrap as above, and chilled in the refrigerator. 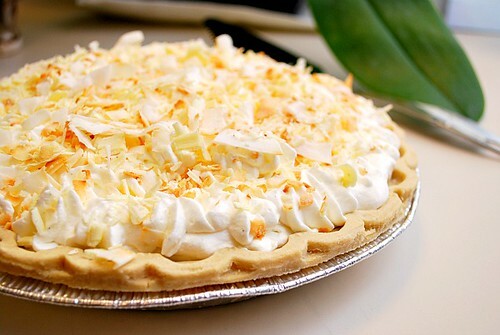 When you’re ready to serve the pie, fill the prebaked crust with the cream, then top the filling with the whipped cream, coconut, and white chocolate. 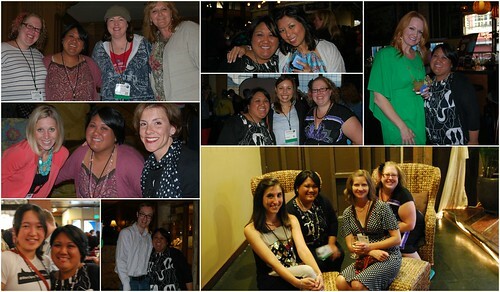 It sounds like BlogHer was a lot of fun!! Great recap! Can't wait to see you in Austin. The flavor was yummy and the filling was firm enough. I love, love the texture of this pie.